I suspect most of you think it has been pretty quiet around here because we’re crazed, sleep-deprived and wholly consumed with nuzzling squishy baby cheeks and, well, you wouldn’t be completely off-mark, minus the crazed part. But mostly it has been quiet around here because we’ve been trying to use any downtime we can spare to take Jacob out as much as possible, as much to maintain our own sanity as his. And let me tell you, this two-week old has been everywhere: Ess-a-Bagel, The Doughnut Plant, The Pickle Guys and today he even made it to the Shake Shack. He’s been to two parks, been carted around with countless cups of coffee, caught a first fall leaf and even hit a farmers market, where he attempted to make off with an eggplant before we intervened. Who knew 11-day olds could already have such wayward ways? I can’t tell you how happy these little burst of fresh air make us, not only because I’m really impatient about not being allowed to exercise for four weeks or swim for six (!) but walking is deemed safe, but because this is kind of exactly how I hoped it would be. I spent a lot of time this summer waddling around the different Greenmarkets (“scaring the locals” as I’d call it, as people seemed uneasy to see a 9 million months pregnant woman out sniffing produce, and not home with her feet up and her spoon buried in a pint of Haagen-Dazs) and imagining how much fun it would be to do the same with our baby. “We can’t wait to take you everywhere” I’d say to my stomach (no doubt giving the people around me more reason to look uncomfortable) as I stuffed eggplants, tomatoes and zucchini in my shopping bag. Some of those eggplants ended up in this dish, which if I had been the kind of person who froze trays of meals before the baby came, this would have been a perfect candidate. Instead, we ate it at once, and greedily. I hadn’t stuffed eggplants before — just bell peppers, summer squash, onions and mushrooms — but I’m officially converted. I loved the way as the walls softened, the eggplant flesh became part of the dish. This is no hard and fast recipe; you can tweak it any way you see fit, swapping the ground meat, changing the spices, adding more vegetables — have fun with it. But do make it. I see those little eggplants still lingering at the market, and they’re too cute not to take home with you. Just make sure you pay first. Hollow out each eggplant with a melon-ball cutter, working from bottom end and leaving about 1/3 inch eggplant flesh along interior walls. Rinse rice in a sieve under cold water until water runs clear. Drain well. Heat oil in a 12-inch heavy skillet over medium-high heat until it shimmers. Fry pine nuts, stirring frequently, until golden, about 3 minutes, then transfer with a slotted spoon to a bowl. Sauté onion and garlic, stirring occasionally, until golden, 6 to 8 minutes. Transfer 1/2 cup onion mixture to bowl with pine nuts. Add stock, tomatoes, 3/4 teaspoon salt, and 1/4 teaspoon pepper to skillet and simmer, uncovered, while stuffing eggplant. Add rice, meat, allspice, one teaspoon salt, and 1/2 teaspoon pepper to bowl with onion mixture and mix well with your hands. If sauce is watery, transfer eggplant to a plate and boil sauce, stirring occasionally, until thickened slightly, 3 to 5 minutes, then adjust seasoning if necessary. Return stuffed eggplant to sauce. Squeeze lemon over dish and sprinkle with parsley before serving. This looks and sounds absolutely fantastic! I just recently discovered your blog (I know, I know; where have I been?) and adore it. Your writing style and your photography are just wonderful. Can’t wait to try this recipe. And congrats on your new little one! You are amazing! I assumed your food blog would practically end with a new baby, but you are balancing your new life so well! The food looks amazing as always, but it’s that little munchkin that I can’t stop looking at. He’s so adorable!! btw- we’ve now added Jacob to our list of possible names for our boy, it’s a definite contender right up there with Henry! Aww you’re little boy is so cute, love the pic of him with the eggplant! The eggplant are beautiful. Sadly, even tho’ I grew different varieties this summer in my garden, no one in my family likes eggplant. Unbelievable! Also, reading about taking your baby outdoors… we lived just barely outside of NYC when our first daughter was born, and I constantly took her into the city to walk. She had gone everywhere too by one month. Those were the days of The Silver Palate on the upper West Side! yum… that sounds so good.. I am from the middle east so take that from me, dont throw the flesh away especially that of Zucchini/courgettes (u can stuff those as well, we stuff everything even tomatoes). In a pan put little oil and onions then add the flesh, spices and then eggs…cook well and then add salt….”sa7tain” Bon appetit in arabic. I was just going to ask what to do with the scooped out flesh. I hate waste. Yum! These look delicious. Hope you are enjoying your babytime and dealing with a stroller in NY isn’t too tough. The Pioneer Woman just offered a recipe for Baba Ganoush and now you have stuffed egg plant for us. This sounds rediculous, but I just had my first taste of egg plant..yesterday! It’s true (!) and it was only a taste. It was in the form of baba ganoush as a sample at a local mkt here. It was good enough that I bought some. I’ll have to give this stuffed egg plant a try now. Thanks, Deb. I have been following you blog for quite sometime now. never left a comment. Bless the sweet little baby! Love love love Mediterranean food! This looks soo awesome.I will have to give this one a try. I’ve never stuffed eggplant either- it sounds amazing! Can’t wait to try this out. I’m impressed that you are back at it so soon and agree with everyone else, you have one of the cutest babies on the planet! And walking everywhere with a newborn sounds lovely. My daughter was born in January, which provided the upside of cozily delightful cuddling at home for a few months, but didn’t allow for much exploring. This next one is due in the end of November, so probably similar scenario. You will feel so much better when you start up your exercising again, after all that walking! Can you include a picture of Jacob in every post from now on? Thanks. He’s too adorable! yum–we do an Indian-spiced stuffed eggplant with ground lamb (I know you don’t like it, Deb, so turkey or beef would be a good swap), besan (which is chickpea flour), & tomatoes. so hearty & perfect for fall. PS–good & great & yay for you, Alex, & Jacob for being out and about. happy parents = happy baby. period. Just in time for me to use that little eggplant I got in my CSA box this week! Your energy astounds me and your recipes and photos inspire me. I hope to try this one ASAP. (Maybe tonight!) Thanks! Oh, fantastic! Another veggie to stuff! I think we could try this with soysage in place of the chuck, since we are vegetarians. It’s good to know that your son has eggplant magnetism. How fortuitous! I was just at the market this past weekend admiring some baby eggplants (they ARE adorable) and wondering what to make with them. Well, this is obviously the answer! Looks delicious! I love that you’re taking Jacob to the greenmarkets. Nothing warms my heart at our big farmer’s market here in Baltimore like seeing whole families together. It’s good that you get that kid eating local from the start! PS-This recipe looks awesome! I hope the eggplant lasts long enough for me to try it! Can’t believe you and Ree both featured the beautiful eggplant today! I love, crave, and dream about eggplant, fondle them in the store, and nobody in my family likes it but me. I’m gonna cook some anyway. So there! Maybe I can indoctrinate my granddaughter. After all, she is only 2 and will try nearly anything. I know you’ll soon be giving precious Jacob little tastes of all kinds of wonderful things, and he won’t grow up to be a naughty husband who won’t touch cheese or exotic vegetables! This looks delish! Again I am so enjoying your photos! These eggplants look perfect for a lunch or dinner in our Sukkah! I will have to check out the acorn squash recipe as well. Jacob also looks delicious as well! Last night I prepared an Indian-style savory stuffed sweet potato recipe from one of the Moosewood Restaurant cookbooks. (The low-fat one, I think). I love Indian food, but haven’t had the courage to try. The stuffing of onions, garlic, ginger, jalapenos, bell peppers,cumin, peas, lemon juice and potato innards was mixed with some neufchatel cheese. Lucious. Happy Sukkot and parenthood, p.j. Yum! I saw this on your flickr feed and have been waiting for the recipe to come! (I actually don’t like looking too often because I prefer to be surprised about what’s coming.) Assuming there’s a break in the rain tomorrow and it’s possible to go the greenmarket, this is getting made this weekend! Wow, these look amazing. I think this recipe might even make my husband like eggplants. Thanks! And many, many congrats on your little Jacob. He is beautiful. He is so cute! I’m not a baby obsessed type, but he’s a cutie pie. I am totally making these this weekend – it is rainy and gray today, and predicted to be on Friday, so as long as I can make it to the Farmer’s Market on Saturday am I’ll cook these while I work inside. And the acorn squash too. and your sweet Jacob is gorgeous – glad that you are able to be out and about. As a newly wed who’s discovered a passion for cooking, this is one of my favorite blogs! Quick question on this recipe… I am allergic to onions and am constantly having to adapt recipes that include them. Would this taste alright if the onions were omitted? Or do you have suggestion on what to substitute? Thanks so much and congratulations on your new bundle of joy! Where is that sweet baby’s hat?! Sweet post, and delicious looking eggplant! As the mom of a 6 week old I am impressed. Leaving the house is no mean feat, but continuing to blog as well? That’s a whole other level. Beautiful post, beautiful baby. I think you would saute the eggplant flesh that you removed and stuff it back in with the meat, correct? I don’t see that mentioned in the instructions, but I think that would work. Did anyone try this and use the eggplant insides that way? Q’s about the scooped out eggplant — You know, I chucked it because I was being overly literal and the recipe did not say to reserve it however I think it was a darn shame to waste it and would totally sauté it back in next time. Vegetarian questions — Definitely think that lentils would make a fantastic substitute for the meat. Vanessa — It was 70 degrees, so we skipped it but in hindsight, yes, next time. This is actually my cousin Melissa’s recipe – I’m so glad you found and blogged it!!! Jacob is too cute for words!!! Love the pictures! These look delicious! I never used to like eggplant, but a few recipes lately have been converting me and I think this one is likely to be added to that list. I also wanted to note that your recipe for butternut squash linked from three years ago was one of the first that drew me to this blog (although I’ve shamefully yet to try it). Thirdly, he’s precious. Congratulations! Those eggplants look super delicious. And wow, I’m impressed that you’re blogging with a 2-week old! I remember trying to take my 2 week old to the post office–what an ordeal!! Glad to hear you’re toting him ’round like an old pro! 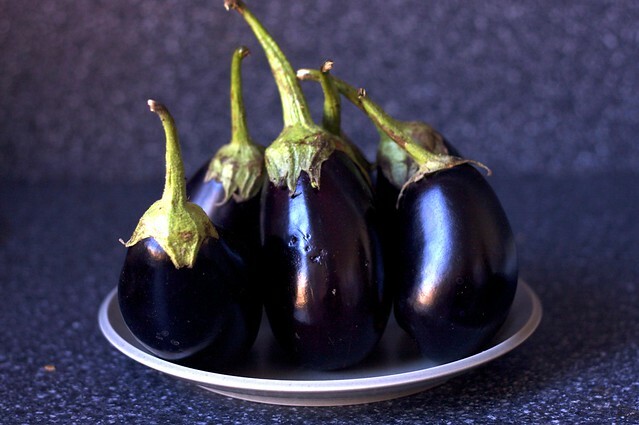 The eggplants look luscious–must do this recipe this weekend! My (no longer 2 week old–he’s 11!) boy loves eggplant–yay! What a sumptuous photo. It almost makes me want to dig into eggplant! (I thought they were chicken legs at first). Any suggestions for a meat-less option? Looks so delicious but we are a house full of vegans! loved seeing the pix of babster…he looks so peaceful! gosh is he ever handsome! I love your blog and now with the addition of baby pictures, it is pretty much perfect! Mmm… stuffed eggplant. And congrats on your new arrival. Definitely get out and about before the weather gets cool, although my boy and I still managed to get out most days in the winter. You go nuts otherwise! I’m a big fan of the JJCole bundle me. It kept him warm and toasty in those cold months. Nikki (comment #43) – I’m currently going dairyless (and am always vegetarian) and I was thinking that this recipe might work really nicely with lentils instead of the ground beef. I might just have to try it! Look at your little peanut with the eggplant! Too cute! The eggplant looks delicious – I’ve always been a little hesitant to try stuffed eggplant, but your recipe looks like it is worth a shot! I’ve never tried stuffed eggplant before but that recipe sound so delicious. I love the baby pictures as well. Even though I’m not usually the warm and fuzzy type they make even me smile. That dish looks delicious and your little boy is darling! Especially with that eggplant nestled in next to him… too cute! Just made stuffed zucchini last night from my mom’s syrian cookbook. Might have to make stuffed eggplant tonight. Yum! I’ve always been apprehensive about eggplant, but this looks fabulously fantastic! If I’ll enjoy the bambino eggplant as much as the precious photos of your bambino, then I’m covered! Recipe looks delicious, but what do you do with the leftover eggplant you’ve scooped out? I’d be inclined to cook it up with the onions and garlic and stuff it back in. I have never been a big fan of eggplant. Well, I guess I should rephrase. I want to be a fan of eggplant because I love its color, but I have never had much luck with any of the recipes I have tried. This looks very yummy, so maybe I will give it a try. Wow, little Jacob has more of an active social life than I do! Beautiful! Hope to try this but we don’t get any aubergine like that here in N. Florida. What a lovely read this was. Baby and eggplant. Gorgeous. What an unbelievably sweet looking baby! He is precious. Did it work well to stuff the eggplant as shown in the first photo? I think I’d like to try baking these in the oven that way (instead of simmering on the stove) but I’m curious why there were no “after” photos of those. Oh my! What a post: I laughed out loud! And the recipe – perfect. Your son is just beginning his life under your wings; my daughter is (once again) exiting mine and extending her own, on Thursday, moving to Canada from NL, hoping to build her adult life there, doing green and responsible things, settling. She adores eggplant (I don’t) and this will be a perfect goodbye supper, substituting chickpeas, perhaps, for the meat, which she does not eat these days. This looks delicious! I have a couple of eggplants in the refrigerator that I picked up at the farmers market this week and this recipe would be perfect for them. Disregard my comment – I looked at the instructions again and realized that you were stuffing the eggplant from the bottom, not the top. From the second photo it looked like you had cut a whole into their sides to stuff them. My mistake. what a lovely baby, and waht a wonderful eggplant recipe, i love love looooove eggplant, this is my dream recipe, thanks a lot, lovely photos! Oooohhh…I have been waiting for you to post another photo of your beautiful baby, Jacob. He is so beautiful, Deb! (The eggplant looks good, too)! Love the photo of baby and eggplant. I have a ton of red peppers on hand (cheap a the farmers market this week), so will use this stuffing with the peppas. I’m a regular reader (and big fan) of this site but a first time commenter. I’m not a huge fan of eggplant (though I’m sure that if anyone could change my mind it would be the smittenkitchen), but today I’m breaking my silence for a very important reason… I’m sure you’ve probably been told this but I think your kiddo is just about the cutest newborn I have ever seen in my entire 25 years on this planet. Congrats on your new addition. yummy…i love eggplant, and just got several from our csa pick-up yesterday, so this just might be on the menu this weekend! I want both. The eggplants and the adorable little nugget sleeping in the carriage. Love the way you’re getting him out into the world. It’s just the worst when people hibernate as soon as they get home from the hospital. The world wants to see babies and babies want to see the world! Can’t wait to try and make these (eggplants, not babies- not just yet (hee hee)). These look incredible! And your boy is just too cute. I can’t stand it! I *love* stuffing vegetables, probably has to do with my Russian heritage. I’m always coveting my aunt’s recipe for stuffed peppers and I have glimpses of a childhood memory of stuffed potatoes that has always intrigued me. I’ve never tried it this way, but oh, I’m going to! Little Jacob is really beautiful. Love him snuggled up with that eggplant, too cute!!! I must admit, when I received the email update announcing the birth of baby Jacob a big “aww” popped out and then an “oh no”, because your recipes are my recipes. And while I haven’t made any amount of yummies shadowing the amount you’ve made and posted, I was afraid I would run out of new things to make. Not that it would be a horrible thing to make something twice (like your horseradish potato salad or sweet potato and sausage soup or that yellow birthday cake or irish car bomb cupcakes). But you’re still posting new recipes, and I’m still making lists of your recipes that I need to try, which is really just your page of recipes with little check boxes next to their titles. So thanks for keeping the SK alive and congrats on your darling little boy. Awesome! I love stuffed veggies! I’m a vegetarian, so I think I’ll sub some brown lentils for the beef…yum. Keep an eye on that eggplant snatcher! He looks like a sneaky one! i must try this! as soon as i find those cute little eggplants like yours! It looks delicious, i love to stuff eggplants with mushrooms but i should try your recipe! I just had my first baby (a boy too!) in May. His first outing was the farmers’ market when he was five days old. :) Congrats on Jacob and I’m looking forward to trying this eggplant dish. Those eggplant are almost as cute as the little peanut sleeping by them. It also works well using the ‘ground meat’ from Morningstar if you want to make it veggie friendly…. I love the recipes but as an expectant mom, LOVE the shout-out to the babycenter.com emails! I love them and I’m glad to see I’m not the only one. The eggplant and the baby both look delicious but I am now officially craving the acorn squash. Except because I’m lazy and can buy pre-peeled and cubed butternut squash I use that instead. A baby stuffed in a blanket and stuffed eggplants. Both cute and you want to gobble them up. That little one is so darn cute! Unfortunately none of my 4 children like eggplant…sad isn’t it! I on the other hand love it and have plans to make this but will have to change the name. What they don’t know won’t hurt them! This looks great! And please keep the baby pics coming – every time I see them I smile. though ive always thought your food pics were amazing, your new baby pics beat those by a million. keep them coming…he’s stunning. You and Ree both posted eggplant. How odd? I love the photo of the baby with the eggplant. Your photography is great!!! I’ve never stuffed eggplant before, but many a family member has, along with squash and grapeleaves, heh. But I saw these pictures on Flickr a week or so back and thought “Daaaamn, what did Deb make this time? !” While I don’t often trust myself with meticulous tasks like hollowing out eggplants, this makes it quite tempting. Mmm…this looks delicious. Off the topic, but I need to know. Where did you get that gorgeous blanket? And the stroller? I love them! My husband’s family is from the Middle East, and I am going to make this for him! It looks great! Glad to hear you are all well and happy and taking little Jacob on culinary adventures. Really really happy to hear that! As for the stuffed eggplants, they are gorgoeus, of course. I never thought or heard about that dish and I love eggplants. So this goes on my to-make list. All the best to you until the next post. xo. 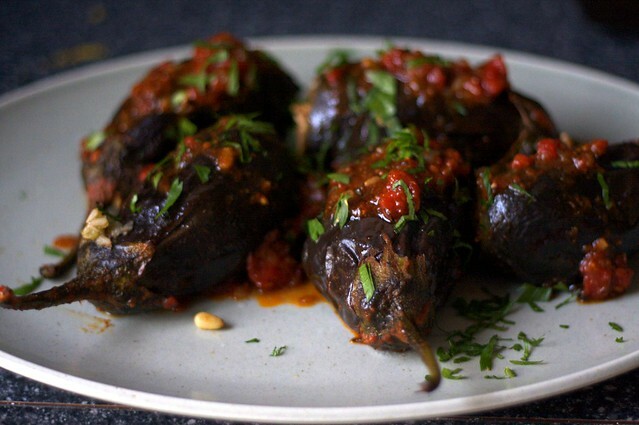 This is torture…you and Ree both posted the most delicious looking eggplant recipes today! You two must be conspiring to get people out of their houses to go out and shop for eggplants (which is what I’ll now be doing this afternoon). Thanks for continuing to post recipes and for sharing the outrageously adorable photos of Jacob! i love the places you’ve been taking jacob. had to look up the doughnut plant though. yeasted creme brulee doughnut, huh? i will have to take a walk down there while the weather is still nice enough. i have never stuffed eggplant before, and this looks yummy, especially with lamb. also looks like it would work well as a vegetarian dish. does rinsing the eggplant remove some of the bitterness? I have a confession to make: I’m terrified of eggplant. We never ate it when I was growing up and a few months ago I got up the guts to try cooking it and when I cut it open, it was all brown and squishy on the inside and I threw it away and made my dinner with zucchini instead. Your dish looks so good, I’m tempted to give eggplant another try. What a cutie pie, he is the size of the eggplant! Finally, a recipe for eggplant other than the usual parmesan. It looks almost as delicious as your little one. Kudos to you for balancing everything so well. I also would need to convert this to a vegetarian stuffing, but given the large number of baby eggplants in my farmshare box, I see some recipe tinkering in my future! Awww, please keep the pictures of your little cutie coming, he’s so adorable! I’m glad you’ve been able to get out and about with him! Stuffed eggplant is a great idea, they look delicious! I’m a long-time reader and baker of your bread recipes (all of them), and a never-commenter. I have to tell you that I have loved reading about your adventure all summer, and all summer, you’ve known exactly what my lazy city-bound rear end wanted to eat even before I did. Thank you for being so generous, and sharing baby Jacob’s story with us. What a beautiful 9 months’s worth of writing you’ll have to look back at. lol! I love the photo of your baby with the eggplant..
Yum. Think I’ll try tempeh instead of lentils for my meat analog. This brings back such memories …and my babies are 18 and 21 and both in college. Enjoy. And keep letting us know what you are cooing! Congrats on your new baby! He is adorable, and love the picture of him cuddled up with an eggplant — definitely a foodie to be :). The eggplant looks fantastic. Thanks so much for showing the baby pictures too…just can’t get enough of that cuteness! Lovely….All you need is some ribbons and you can box him up and send direct to the Netherlands. Though how my lil boy would react to that…I don’t know but lets try, shall we? I just found your site last week (yes i’ve been living under a rock) and I love love love your photos. Those eggplants standing on that plate have real personality (+ il piccolino [the little one] sleeping next to the eggplant is all kinds of adorable). ps: the baby will love it there. He is so adorable:) I love him asleep with the eggplant. My grandmother stuffs little eggplants with a mixture of chickpea flour and some other stuff, including an amazing combination of spices, and steams and then lightly pan fries them whole. Oh boy are they delicious. Not exactly dainty little appetizers that you can pick up and swallow but definitely the lone star of any meal ensemble. Hi there thanks for the lovely eggplant photos with recipes. Can’t wait to try it. I just love this time of year when the butternut squash, acorn squash and eggplants are plentiful and a lot more reasonable in price. You can do so many different things with them. I must say “Jacob” will be my pick for the best of the year posts you have made. He is a doll that is for sure. So happy you let us see him again. Enjoy the weekend and thanks for your most welcomed news. I read and reread it many times. I used to talk and sing to my baby bellies all the time. Both kids came out knowing the words to the Everly Brothers “Devoted.” And now the youngest fruit of the baby belly is 16 1/2 and a vegetarian. Think I’ll make her some of these eggplants without meat and the rest with meat for her carnivore parents. The first escapee from the baby belly is off at college, where he is happily not eating vegetables…sigh. Where can the nutration values for these dishes be found?? Toda raba! Beautiful baby, beautiful pictures. And to Orville, above…hmmm…maybe in a lab? Or your stomach. :-) Hee hee. Love your kitchen menu!!! Thanks for all the great goodness and sharing that beautiful baby boy with us older folks!! I love reading these little stories…..awwww so cute. Motherhood suits you well. The love just bursts through in your writing. Wow, Deb that looks awesome! And such a cute little eggplant you’re stuffing! I’m due in Feb and am busy looking at baby gear- what kind of stroller is that? Thanks! Wow, this looks yum. There aren’t many eggplant recipes I’m super-crazy about (with the exception of a good baba ganoush, yum! ), which always makes me sad, because the beauty of those purple orbs calls to me in the markets! This looks like it would be a winner. Must make! I haven’t tried many eggplant recipes, but this one looks too good to pass up! (And I agree with you about the Acorn Squash recipe.. I made it again, recently, and it is amazing.) 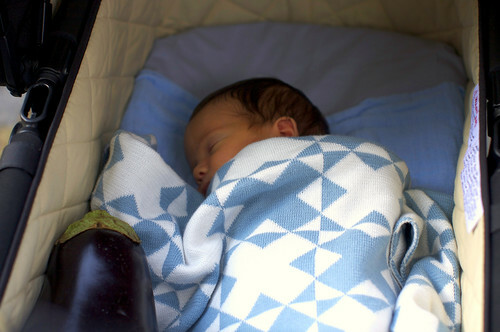 I love the pic of your little guy w/ the eggplant too- so adorable! (btw- I look forward to reading your blog even more, now. I’m not sure if I love the baby or food pics more.) Thanks for sharing! I don’t even like eggplant, and that looks good to me. Maybe it’s the accompanying baby picture … it’s making my ovaries squeal and do little backflips. I just logged onto your site to look up your yummy coffee cake recipe and saw the picture of your beautiful little boy! Congratulations! I wish you and your family the best! YUM – have this on the stove right now and I can already smell that it is going to be a winner. But – yuck – second wormy eggplant from the farmer’s market this year. Good thing I bought extra – it looked perfect but inside? don’t ask…. your photos are beautiful. This all looks so delish. I just put up a Caribbean Stuffed Bell Pepper recipe as well… tis the season to harvest our peppers and eggplants! Congrats on your beautiful baby as well…. I am going to make these tomorrow, well, the vegan version of them. I can’t wait to try them! I know they are going to be yummy. when my boy was still a couple weeks old, i just tried to grab every free minutes to sleep instead of doing anything else. you are such a super mom that you could still spare yourself to come up with such wonderful dish! I’m so glad to read that you’re cooking and blogging just like always. Also glad that you’re taking your precious little angel out to experience the world. What a wonderful gift to him, to broaden his horizons at such an early age. The more diversity and culture and of course culinary excellence you expose him to, the better. Your son is probably one of the cutest babies I have ever seen. He’s just so perfect…. Oh, and the food looks good too. Congratulations on such a healthy, happy looking baby. I think you did a beautiful thing by schlepping your beautiful son to the Doughnut Plant. Nearly a sort of religious initiation in some circles. Oh dear Lord. First of all, this looks very very delicious, both the dish and the tiny human. And then, I’ve just discovered your “Surprise me” feature and will not be able to end the cycle, of “Wooow”, “Control salivating” and “Bookmark”. I need to study, I really do… maybe surprise me just one more time… Wheee! The timing of this is so funny. I saw baby eggplants at Whole Foods and I couldn’t resist their cuteness. When I brought them home I searched Gourmet for a recipe and this is the one that I decided to make. Lo and behold, you posted the recipe the day I made it. At least I knew that there weren’t any issues with the recipe. This was so good, and it made a really nice presentation. One note for others that may want to try this: my pine nuts went deep brown in less than a minute in the hot oil. It could be that my pan was not heavy enough or my range runs very hot, but next time I would keep it on a medium flame and watch them very carefully. I would also dial back the allspice very slightly, and maybe add a pinch of cumin. I am so glad someone else shares my philosophy on babies being portable and too often I hear of people who hide at home when their doctor says to take it easy. And you are taking him to such wonderful places and letting him experience the world with you as his guide! We call aubergines brinjals here and I have 2 stuffing recipes nothing like this, and I really should brave up and expand my horizons. Might bake them covered in the sauce though to avoid boo boos. This looks wonderful. As an eggplant lover I’m always looking for ways to cook them. You’re doing a remarkable job: cooking, talking care of baby Jacob, walking him around the city etc. I’m so impressed. I could barely get myself dressed each day when my two were newborns. Thanks for sharing with us. I can’t believe what a calm, easy going mother you are. This is one VERY lucky kid to have such caring parents. Deb, he is so precious and I am so glad to hear that you are getting out and enjoying yourself. Very impressive so soon after your C! Your eggplant looks great, but Oh My God has there EVER been a cuter baby than yours? PLEASE include pictures of him with your posts! I want to weigh on on a very important topic and that is the cuteness of this newborn boy. I have no children of my own (though I love hearing my friends talk about theirs). I know nothing about babies, mostly from the fact I’ve never really been around them. So I feel confident I speak as a pretty neutral observer when I say that is one amazingly cute kid! It’s not just your new mommy hormones playing tricks on your mind. Congratulations to you both on the newest member at your dinner table. p.s. How in the world are you managing to balance such an active blog and a newborn? Amazing! OMG! This dish is so delicious! I saw the e-mail w/recipe in my in-box yesterday right before I headed out to the farmer’s market at Union Square and I was able to score some late day discounted baby eggplants and some local grass-fed beef (this is a leaner beef, but it seems to have worked out just fine) among other ingredients and then make the dish tonight. I took some suggestions from other posters like putting the scooped out eggplant inards back into the stuffing mix and baking them in the oven rather than cooking on the stove top. They came out perfect! This recipe is definately going in the favorites file. He is so beautiful! (lots of friends have had babies recently and usually I just give them the “precious” or “sweet” compliment, but your Jacob is truly beautiful. Good job!) It took me weeks to get out of the house with my newborn for anything other than necessities. It’s awesome that you’re out and about so quickly. Enjoy! Jacob is really a darling! I have made the Turkish version called Dolma. But since I have lots of homemade chicken stock on hand. I shall give this a try! Yes, count me as one who thought that you’ve discovered that baby + blogging is quite a juggle – but sounds like you are taking it all in stride, good job taking baby out! I couldn’t get around the block with our little one until he was about 4 weeks old. Have you gotten the “The baby is to young to be outside” comments yet? I absolutely hated those comments. Gah! I wondered (as did my own mother-an OB nurse!) if those people thought that babies were placed in pneumatic tubes at the hospital and sent home. Easier with my first, since I had him naturally, but even with the second (C-section) I was up and out with him at 4 days old. I was so excited to try this eggplant dish but the food coop was out of ground lamb so I substituted lentils and it was a delicious vegetarian entree (even my lovely but carnivorous in-laws liked it!). Also – since I don’t have melon baller I used a grapefruit spoon to carve out the eggplants and it was very effective…Thanks for an inspiring-ly beautiful post! I never fawn over the children of strangers, but Jacob is beautiful. Btw, have you heard that they’re shutting down Gourmet? http://mediadecoder.blogs.nytimes.com/2009/10/05/conde-nast-to-close-gourmet-magazine/?hp So sad. I’ve always preferred it to Bon Appetit, but at least one of them is still standing. Totally bummed about Gourmet as well. It is the ONLY magazine I subscribe to, food or otherwise, and I am constantly inspired by their photography and recipes. I have to hold myself back from reblogging entire issues, such as the August one — it was not easy. Melissa — I felt the same way. Don’t worry, you’ll do things the way that is right for you. Just this morning I caught your flickr stream and last night the photo of both your boys on FB. And my, does Jacob look like an angel. It’s so cool that he’s already been gallivanting all over the place! Just as soon as I saw that eggplant I knew there was something coming up on smitten kitchen. I have a new found love for eggplant and what you’ve made looks delicious! Oh NO! Say it isn’t so! RicaSuave #152 what hilarious comment! And I agree, His Royal Cuteness is perfectly interchangeable with Jacob. The eggplant look good enough to nibble on too! Lovely pics. I always enjoy shots of babies and food. I have a pic of my almost 8 year old, when he was 3 weeks old and laying on a kitchen counter face down next to the prepped but uncooked thanksgiving turkey. Still makes me smile thinking of it. Those look great, Deb! Here’s a recipe for the Turkish version — pretty similar, but without the rice. This post absolutely made my weekend!!! I am due with my first in April. Ever since I found out I was pregnant, I have been vowing not to become one of those people that stops living life just because there is an extremely cute little critter to tote along. However, I don’t have much evidence in my peer group that this kind of adventurous parenting exists. Apparently the most common way to bond with your baby during maternity leave is by staying in your pajamas all day watching the View in between feedings. Your attitude about saving your sanity and your baby’s by getting him out and about gave me confidence in my aspirations. Thank you. Congrats on the baby. I made ths stuffed eggplant recipe last night and it was fantastic. I adjusted it slightly to use what I had in my fridge. I diced up the last of the pancetta, rendered it and added it to the stuffing instead of ground meat. I used the pancetta fat to saute the onions and garlic and threw in a generous omount of fresh rosemary and mint. It surpassed expectations and I caught my wife, Susie, licking her plate, the highest compliment, believe me. I must say. Your photos are more appetizing than Gourmet’s. :) I love this dish and the different variations I make. What a fabulous way to prepare eggplant! It sounds as though little Jacob is the man about town. What a sweet little guy. I am obsessed with stuffing baby eggplants! I’ve never stuffed like this before…usually just make two slits 3/4 of the way down the eggplant then slide the spices into the slits with my fingers. A heartier stuffing sounds great. Great post – we have 9 more weeks (gasp) until our little one arrives! Hoping that the weather isn’t so chilly by then that we have to hibernate indoors with baby. did you hear the sad news about GOURMET? How dear of you to offer photos of your adorable baby and a recipe using adorable Bambino eggplants. I guess you can’t escape the world of miniatures. Enjoy these beautiful fall days. Winter is approaching. It’s a wonder to have time to blog at all. Love the wee one! So cute! The eggplant is cooking right now, but I had half of the meat filling left over! Were my eggplants too small? I am making the extra into porcupines, which is a childhood favorite of my husband’s. I would love for you to post a recipe for butternut squash/apple cider soup. I had some a restaurant in NYC last fall and it was the most perfect meal on that rainy fall day. I tried Ina Garten’s recipe minus about two onions and still found it overwhelmingly onion flavored. I always crave a good soup in the fall. Thanks. I have had stuffed eggplant before but never attempted on my own. Looks lovely. BUT I am more intrigued by the quick note about your acorn squash recipe…that’s something I”m expecting in my CSA this week and will make use of. Thank you! can’t wait to make this! and i love seeing pics of the bebe…don’t stop! Congratulations on Jacob’s arrival! I gave birth to my son three days before you. I am also obsessed with squishy baby cheeks. Recovery is driving me crazy – not being able to lift objects, work out, or even drive for 6 weeks may be my undoing. Love the shot of the eggplant in the pram! And the raw stuffed ones, just lovely. OMG . . . Eggplant haters were licking their plates and fighting over a piece of the last ” extra eggplant” . . . So much for lunch. I had extra meat mixture left over after stuffing the eggplants so I rolled into meatballs and cooked alongside the eggplants. They were fabulous too. Mouthwatering! Even this early in the morning. I don’t even like eggplant, and this looks delicious. Also, love that Jacob is so small he could be the size of a large eggplant. Off topic, but is anyone else sad and tearful that Conde Nast decided to end Gourmet? Sigh. Who else is going to give us wonderful recipes such as this one (which came from Gourmet)? My local farm had a variety of eggplant breeds, so I tried one of each. The traditional dark purple variety came out somewhat unpleasantly bitter, I thought, but a round white one with purple streaks was perfection–buttery and delicious, and super easy to scoop out, like making a tiny jack o’lantern! Deb, I’m sure many of us would like to hear your thoughts on the closing of Gourmet, considering that so many of your wonderful recipes come from this source. Also, it’s a bit scary seeing a ground beef recipe up here after reading this Sunday’s Times. I think we should all pull out those lentils now. I’d also love to hear your thoughts on that issue. I know you’re kind of busy with the baby and all, but the food world is imploding before our eyes. Help us! yes, the recipe sounds delish, but what i really came here to say is that your son is beautiful! CONGRATULATIONS and kudos to you for keeping up this blog! These would be great with the purple and white streaked “rosa bianca” variety of Italian eggplants as well. They are usually the perfect size for this recipe (5-6″). There are a lot of varieties of zucchini and squash around the same size that would be great too, though not the same flavor as the eggplant. I’m a huge fan of eggplants (they’re indeed my favourite vegetables) and I’ll certainly have to try this out! Your description of the flesh getting soft and becoming a part of the filling is mouthwatering, and so are the pictures. I love, love eggplants and this is a great recipe to try out. Wow! 186 comments! Is this a record? A baby will do it every time. Jacob looks a lot better than the stuffed eggplant! So there! When I told the local Pickle Guy (Kensington Market, Toronto) that my small son liked kosher dills, the generous Guy fished one out of the barrel, wrapped it in paper and handed it to the toddler. My son still remembers the event many, many years later. this sounds great! i can’t wait to make it! enjoy the walks with your little one :). You’ve been nominated for Best Food Blog for the Bloggers Choice Awards. I had a lot of stuffing left over so just cooked it in the sauce, it was am.az.ing. I want to just reach into the screen and eat those amazing-looking eggplants RIGHT NOW. My neighborhood farmer’s market is on Thursday, I sure hope they have some baby eggplants! These look so good that I can actually taste what they would taste like. Does that make sense? Congrats on one gorgeous baby! I just discovered your blog and I love it! I subsituted basil and oregeno for the allspice and they were fantastic. More than half the filling was left, though, so I made them into meatballs. Also, next time I will cut back on the salt in the tomato sauce, as it got too salty when it was reduced at the end. Thanks for a great recipe! Now, on to the baby–so cute!!! I’ve been reading your site for a long time but I was away and missed the big announcement. Congratualtions! He is too adorable! Any idea whether this recipe will work with the japanese eggplants I picked up at the market this past weekend? Thanks! my brown basmati rice didn’t cook through – after 80 minutes of simmering those suckers. maybe i’ll soak it for awhile next time? Yum yum that looks good. Congrats on the little one! Jacob is the most adorable little thing I’ve ever seen, wow! made the eggplant for a weeknight dinner, yum, yum. used ground pork, because thats what i had on hand, lamb would be even better, yes. but we loved it. perfect as written, used eggplant and tomatoes from the end of the season garden. will make again. thanks. p.s. your ‘little eggplant’ pic was adorable, even insisted on my husband to take a peak at the cutie. okay. i have not yet been able to comment since you introduced Jacob two weeks ago because as some crotchety 97 year old man with elbow pads would exclaim, my computer is “on the fritz.” whatever that means. i feel it a bit absurd that after returning from its stay at the computer hospital, and after checking my email, i find myself at your site with a huge need to CONGRATULATE you and your cinnamon bun swirl of perfection. he is adorable and i sincerely wish your family all the best. with your ability to nurture with food and your lovely sense of humor, you will be a wonderful mother. plus, the SWING doesn’t hurt. My two favorite things in the world: eggplant and adorable babies. Yum and yum! Deb- this looks so fantastic I headed out to the farmer’s market and got some eggplants! Our only issue is that we got two, they are both about 1lb- they’re roundish, but not the baby eggplants you use. Do you think this will mess up anything besides the cooking time? Thanks! I love Jacob’s little friend. Is he in a proper baby carriage and not a car-seat-on-a-stroller? That’s awesome. Corinne — I’ve made stuffed eggplant before, and what I do with either bigger ones or long thin ones (like a Japanese eggplant) is cut them the long way, and stuff them so they look like little canoes. That way you can also cut out/scoop out the seedy section, if there is one. I made this tonight, and it was quite tasty. Still, next time I think I will precook the rice a little because the eggplant fell apart entirely on me and the meat was a little overdone. I think that if I put the rice in the rice cooker while I prepped the rest, it would have come out more balanced. I didn’t have a mellon-baller, so cut in half and just simmered the eggplants in the sauce face up instead. I also added harissa and sultanas to the stuffing. Delish! Anti-eggplant boyfriend loved them. I didn’t have a melon baller either so I used a knife to cut around the inside edge of the eggplant and scooped out the inside with a teaspoon. I then used the leftover “guts” of the eggplant to make an Chinese style eggplant dip by frying the eggplant in Sesame Oil and adding Soy Sauce and Ginger. It all came out really well. When it came to the stuffed eggplant, I followed the recipe exactly and it was really good, but with my leftover beef/rice mixture (I think I defrosted too much ground beef), I added some leftover Marinara sauce from the night before and cooked this all together. The flavor was awesome and it was a great twist. I hope you don’t mind me experimenting with your recipes – I did take some pictures that I’ll upload to my blog at some point. I love your site, and it’s become my go-to-place when I need to satisfy my pregnant wife’s cravings! I’m one of those readers but not commenters, but your baby is just too cute to ignore! Congratulations!!!!!!!! Lilster- thanks for the tip! I looked at the eggplants again and decided I would try to stuff them “whole” and if they weren’t cooking right I would split them. Well, they turned out great! The cooking time was even less than I thought, the rice was perfect, meat delicious, eggplant gooey and wonderful… and it really was pretty simple to put together! Deb, I am amazed (and so, so, so happy) that you still post wonderful recipes with gorgeous pictures even after having your whole life reorganized around the new man in your life. I was all prepared for a SK drought, and am so happy I was wrong! That said, these eggplants were A-MAZE-ING. Wow. I added some chopped rainbow chard (just stalks) because I had some that I had to use, and I used pork sausage instead of beef or lamb. I also don’t have an ice cream scoop so I had to just use a knife, but even still the eggplant were, easy, beautiful, blissfully tasty, and received resounding praise from the dinner guests I served them to. I was sure to tell them all about the Wonderful Deb at Smitten Kitchen and how they should be RSSing this blog because my doing so has brought new joy to my kitchen time. Thank you, so much, for bringing such yumminess into our lives! I can’t wait to try the eggplant recipe.. I love eggplant and although my family loves my eggplant parmesan recipe which has been in our family since I was little, I am looking forward to trying something new! Thanks! This recipe is wonderful! I have already made it two times. What makes it even more wonderful–let it sit for two days.Good luck with the baby and thanks for all your great recipes! Deb – This is a great recipe! I used 1 cup of lentils in place of the meat and we really enjoyed the overall flavor and texture of the dish. Definitely a repeater! A beautiful baby picture. I love the blanket. Good for you, getting out and enjoying the fresh air. I was housebound those first three months but my babies were both born in January- so it was kinda cold. Hi, Deb! Recipe turned out amazing, even tho there were no more baby eggplants to be had and I used two giants instead. Just salted them and let ’em sit for an hour before starting. Subbed Morningstar Farms veggie crumbles for the meat and then accidentally found it still turns out great with Israeli couscous instead of rice… thought I had everything. Oh well. Absolutely delicious regardless, so obviously a keeper! I made this recipe for a dinner party yesterday and it was a big hit!! The only thing I did differently was bake it all in the oven at 350 for 1 hr. I am Greek and have this thing for baking egglants… even stuffed ones. A keeper for sure. I used spinach in place of the meat – yah, I know, go figure – and it was very yummy. Crushed some feta on top. Used the scoopings and the rest of the home canned tomatoes with a few cloves of garlic and cooked it down to make a sauce for Friday night’s pizza. Waste not etc etc. I made this tonight, was delicious! Actually, like everybody else who’s tried this recipe, did things slightly differently. — Subbed leftover medium-rare roast beef for the meat (but did grind it!). — Added the scooped-out eggplant pulp (coarsely chopped) along with the tomatoes in the simmering sauce. Great recipe; thank you for sharing. The photos were lovely as well! That poor babe probably can’t wait to cut teeth so he can taste what he’s been smelling in your kitchen! How does one make this recipe ahead and then cook it off later? I emailed this question and then discovered it would be better to post the question here, my apologies. Hi Amanda — Yes, saw your email but much more effective (and quicker response) here. I haven’t made this in advance but it looks like others who have commented have. I don’t see any reason why you can fridge or freeze it a couple days before you need it, reheat it in the oven. You might want a little extra sauce, just in case it gets dry or “absorbs” too much. Deb, thanks for forgiving my emailing oversight. Please, it’s not oversight. (Just wanted to make sure I didn’t sound rude.) Basically, email ends up in a folder with a boatload of other emails I am working my way through but a comment I respond to within 12 hours, tops — just more efficient. Thanks. Hollowed out eggplants, tomatoes, and green peppers. Browned the ground beef, mixed it with cooked rice, cinnamon, tomato insides, onions, cilantro, (maybe onions were browned too, can’t recall), stuffed all three kinds of veggies with this mix, replaced the caps, placed in a dutch oven, poured enough water to almost cover, and simmered, covered, until everything was tender, maybe 1 1/2 hrs can’t recall. Served with a garlic-yogurt sauce: 2 C yogurt + 1 pressed clove of garlic. This was not my favorite however. Oops! I see you already have beef in yours as well. Somehow I overlooked that. This looks delicious. I am going to give it a go tomorrow using lentils instead of the meat. What a great idea! The lime yogurt cake is amazing and I look forward to trying a lemon version tomorrow. Wow! I’m working through my 4th month of a crohn’s disease flare and have roughly 10 foods I can eat without getting sick. I can have absolutely zero fat or oil, nothing raw or whole grained, and as a super health conscious vegetarian, I love to cook. So thank you, THANK YOU, for this recipe. I was able to adapt it being easier on the tummy (oil-less, pine nut-less, veggie bullion, fresh tomatoes) – particularly great that everything is so cooked through. Even better, I got to entertain with it! It was a huge hit! Cooking is a huge joy that my have stomach troubles have impacted, so again, thanks for giving me the chance to enjoy myself in the kitchen again! I really enjoyed the flavors of this recipe; the tomato sauce with the the lemon juice was fab. The only thing is that the rice didn’t really cook through all the way and the meat got a little dried out. I think next time I would par boil the rice for a few minutes and add a bit more liquid and fat (olive oil) to the meat. The problem may have been that the beef was too lean. I made this last night and it was delicious! The tomato sauce made the dish. If I made it again I’d maybe increase the salt and spices of the stuffing. Also, I made this with larger eggplants – 3 medium-large ones – and each one was a perfect portion for dinner (alongside some brussel sprouts). Thanks! I’m Lebanese but, sadly, am extremely picky with eggplant. 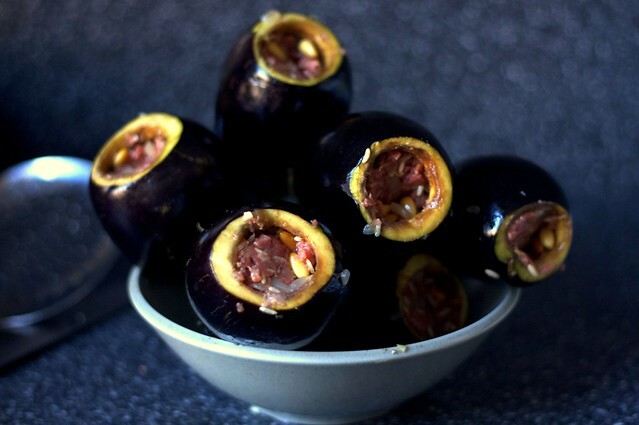 I’ll eat a few bites of baba ghannouj when and only when my mom makes it, or sheikh el mehshe (which is a gloriously tangysweetmeaty dish of roasted eggplants stuffed with meat, pine nuts, onions, and tomatoes served with rice). My mom is a beyond incredible cook, and I am proud (if not a little show-off-y) to say I kind of take after her. Have you ever tried pickling them? I’ve never done it myself but have watched my mom do it every fall, and it goes something like this: You boil baby eggplants, split them open and hollow them out, wrap them in towels you plan on throwing out anyway, and put heavy things like pots filled with bags of dried beans on them overnight. The towels will drink up every last bit of moisture from the eggplants. Then you grind garlic, walnuts, and hot peppers and stuff the eggplants with the mixture. Stack them in jars, cut side up, and fill with olive oil. By the way, I am obsessed – obsessed, I tell you – with smitten kitchen. In my excitement, I stopped after you bought the eggplants and dove to comment. You just made sheikh el mehshe :) Wonderfully, I might add. I have a ton of brown rice I would like to use for this. Any suggestions for how to substitute? Should I precook the brown rice separately or just increase the cooking time of the dish? Beautiful! That’s almost exactly the way my Lebanese grandma makes it. Cute baby, too! 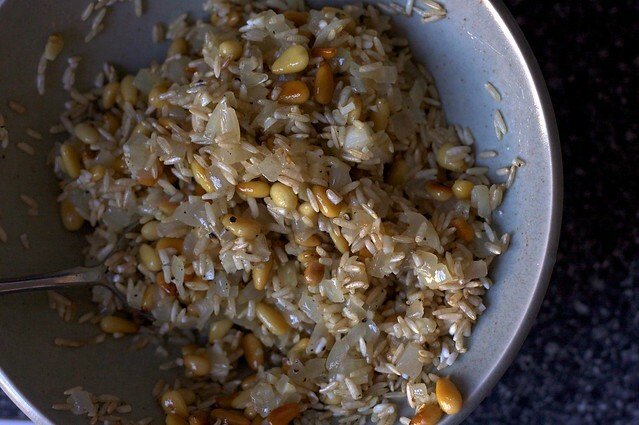 I used 1 cup of rice, 1/2 cup lentils and 1/3 cup pine nuts and left out the meat (we’re vegetarians). I substituted a few shakes of cinnamon for the allspice because the allspice smelled to clove-ish and I don’t have much experience using it. And I used cilantro instead of the parsley since I think everything tastes better with cilantro. Result: delicious! This is definitely a keeper. My 10-year old daughter, who doesn’t like eggplant, ate it up, and I’m thinking of purchasing another dutch oven so that I can make it for company. I have made this with eggplant several times, and it’s always delicious. Last night I tried it with zucchini instead and it was *equally* delicious!! Thanks for sharing such a great (and relatively simple!) recipe. I just wanted to say that this recipe has become one of my staples — such a great use of lamb. Thanks for the recipe! Any suggestions about what to do with the leftover meat mixture? I think my eggplants are a little weany so I have at least 2 cups of meat/rice mixture left and I would hate to throw it away! I have been a faithful fan of your recipes for several years when we were living in Switzerland, which is full of amazing produce of all kinds. Now, living in Sudan, I wander through the supermarket aisles wondering how many ways to cook with canned tuna and canned vegetables and how on earth we are going to live without cheese. Of course, I should have done this weeks ago, I check your recipe index and my culinary brain comes to life again. This will be a staple recipe in our new home and I will continue to explore other options to make the most of what we can find. Merci, Gracias, Shukran. I burnt the bottoms a little bit but it still came out SOOOOO GOOD. I didn’t have a melon baller and hollowing out the eggplants was a pain, but this will definitely have to happen again. I cobbled together a poor student version with marinara sauce, sunflower seeds, spinach, leftover chicken, and curry powder. Still awesomely tasty. Thanks for your super approachable and adaptable recipes! I’m also loving your book! Hey looks great, do you think i could use quinua instead of rice? would that work? I bought eggplant at the store last week and couldn’t figure out what to do with it. It never even occurred to me to stuff it. Thanks for the inspiration! I made this dish and it was amazing but the rice didn’t cook inside the eggplant. It was still a bit crunchy. Should the rice have been steamed before stuffing?? Thanks! I made this recipe the other night and,since I only had 2 eggplant, there was lots of stuffing left over. So,I made some meatballs with them and stuck them in the sauce. It was all delicious and I’ll be making this again. I didn’t have a melon ball scooper,either,so it was a little bit of a pain,but the eggplant I removed I just diced up and put that in the sauce,too. It works! On reheating,a little feta works nicely,also, Thanks! Made this last night but used pearled spelt instead of rice, and replaced the allspice with a saudi baharat mix. Fabulous! I made this over the weekend with little white skinned eggplants. I used ground pork but otherwise followed the recipe exactly. I also had leftover filling and made meatballs. Delicious! Great use for the bounty of eggplant from the garden. Thanks again Deb. I did it and it was amazing. I did some changes. I used small baladi eggplants (google for baladi eggplants), pear sized; substitued lemon by pomegranate molassed, added cinamon, cumin and moroccan sweet paprika. Thank you for offering this recipe, now the family recipe collection has a new one. Thought you might be interested in this identical recipe with a 2010 date. I just wanted to say that this recipe is absolutely delicious! My husband who would otherwise not have eggplant on the top of his favorite veggie list, said they were really delicious. It was worth seeing the look of surprise/smile on his face when he took the first bite :) We have an over abundance of eggplants (both bell and Japanese) from our garden this summer, and I’ve been scouring our cookbooks and other sources for some worthy recipes. I discovered your site maybe 5 years ago, and though I don’t get a chance to look at it regularly, I always take a look when I’m stumped for an idea and you’ve managed to always have something that fit the bill! Thanks again! Sally — I used a mix of a paring knife and a melon baller, and yes, it’s absolutely nuts to work that hard at something — I obviously had too much time on my hands in those weeks before my first kid was born — when you can just halve them and fill them “boat-style” as you did. And as I would definitely do today, now with two kids! Thanks for the great recipe, Deb! I’m trying to start commenting on the recipes of yours that I’ve actually made because I get a lot out of similar comments, so it would be good to help maintain that common resource. I agree that wasting all of the eggplant innards would have been a travesty, so I chopped them up and cooked them down a bit after the onions were done. A scoop went into the stuffing mixture and the remainder stayed in the sauce, I love the way that eggplant breaks down when you stew it for a long time so it gave the sauce great body. To the filling I added some cumin and Turkish oregano, and when I gave the sauce a final simmer sans stuffed eggplants I added a splash of red wine. My vegan boyfriend got a near-identical version with cooked French lentils subbed for beef. His was delicious as well, though I wish I would have thought to reserve the bottom of the eggplant to seal it up in the sauce since without the ground beef the filling didn’t stay put as well. This combo in particular would have been nice with the addition of plumped golden raisins, but I’m sure they would also be good in the meaty version. I’ll certainly make this again! What an excellent use for the abundance of eggplants we receive in our csa this time of year. I made this last night using larger eggplants of a variety of size, cutting them in half and serving them boat style (no turning necessary). I followed the advice of other commenters, sautéing the excess eggplant after the onion and adding it back into the meat mixture before stuffing the boats, which worked perfectly. I reduced the tomato sauce at the end and added the lemon juice and parsley before pouring it over the eggplant. Tasted amazing, will definitely be adding this to our rotation. I finished binge watching Mind of a Chef, and I’ve cooked Gabrielle Hamilton’s smokey eggplant a few times now. This might be my next challenge! Are there any concerns with cooking the lamb? I know it gets gamey and tough when it’s overdone. I hadn’t had any trouble with it going over; mostly, when it’s done, the dish pretty much is. Can I safely make these in advance? How much in advance? I am concerned about the raw, ground meat mixed with everything else and left to sit — but if it were safe, I’d love to mix the filling in the morning, refrigerate it, and be able to cook it at dinnertime. Either way, I am looking forward to trying this with some baseball-size, lovely eggplant we just bought at the farmers market. Thank you. I think it will be just fine as long as it’s in the fridge. Hope you enjoy! Thank you. I did try this, though not with advanced prep. Most of all, thank you for the method. To mix this in advance and to use raw ingredients are revelations, as is doing it on the stove this way. I’ve only ever seen stuffed X recipes that call for cooked rice and cooked meat, stuffed into something that is then baked. which really makes them great for a second-day meal (not to say redesigned leftovers) but not ideal for a weekday quick dinner. Now I have a different way to think about a variety of “stuffs,” if you will, thanks to you. I loosely followed this recipe using lentils (cooked) rather than meat and it was great! I also used one medium/large eggplant (what we had in the garden), halved. Thanks for the inspiration! I was planning to make the SK lamb merguez for dinner and purchased a “normal” eggplant, not yet knowing how I’d prepare it but ready to follow the lead of the merguez’s flavor. Having already committed to the merguez, and having already cut my eggplant into large chunks to sweat before I chose my spices, I began to feel ill at ease about what came next. Enter this recipe, some leftover plain rice, a well-stocked pantry, and sort-of voilà: a deconstructed and vegetarian eggplant side that complimented the merguez fabulously (and honestly kind of stole the show). Yay! I made this yesterday with some large some small eggplants but couldn’t hollow them out?! So I just cut them in half. But my rice didn’t cook and I ended up overcooking the eggplants in the process of trying to cook the rice. I honestly couldn’t figure out how to cook the rice, as there was no liquid in the eggplants. How did you do it? It’s supposed to pick up liquid from the eggplant and the sauce. Maybe it didn’t capture enough because the tops were open? O. M. G. I just made this and it was so the thing that I needed to end a bad day! I used leftover homemade tomato sauce and some diced fresh tomatoes from my garden in lieu of the canned tomatoes. I made a bit extra filling by accident but then I just added it into the sauce while the eggplants cooked, and it bulked up the sauce quite nicely. The stuffed rice took a little longer for me to cook (about 20 minutes longer). This is such a delicious eggplant recipe, I will definitely be making this again very soon! Made this as kind of an experiment with many alterations – mostly that I used big eggplants and hollowed them out from the side to make it easier. I started cooking them stuffing-hole-side-up, then rotated them so the stuffing-hole side was down/in the liquid. The rice didn’t ever cook though. If I were to make them with raw rice again I’d maybe start with the stuffing side in the liquid, but what I’d really do is just cook the rice beforehand. It kind of seemed like the meat sealed the rice in/prevented the liquid from getting to it and cooking it. Anyway, the flavor was good even though I refused to spend a gazillion dollars on pine nuts and didn’t have allspice – just used some cumin instead. What did you do with the eggplant you scooped out of the shell? It didn’t go back in the dish in some way? It’s not that I couldn’t use eggplant–vegetarian chilli comes to mind. It’s just that I was looking for something a little more eggplant-y.